Sully is a fine film — a compelling, suspenseful account of a few hours in which one man, who had been responsible and brave and reliable his whole life, made the best decisions under incredible pressure and saved all “155 souls” on US Air 1549 from death. In doing so, he saved a nation from yet another heartbreak involving airplanes and New York City. And then — then — he hit turbulence. As it turns out, a storm of media, courtroom analysis, corporate politics, and insurance agents can be just as dangerous as losing both engines in a birdstrike. Director Clint Eastwood is — no surprise here — a reliable craftsman with a keen eye for complexity within what seems, at first glance, simple. What we knew as “Miracle on the Hudson,” he reveals as a situation that brought out both the best and the worst in our fellow Americans. Once again, he raises questions about the nature of heroism and hagiography in America. (He did that so well in Flags of Our Fathers and American Sniper, which were far more complicated and troubling films than moviegoer dialogue seemed to suggest during their theatrical releases.) And he expresses quiet concern about Americans’ voracious appetites for hero stories, and the harm we can do in our rush to make celebrities of — and then discredit and disgrace — other human beings. 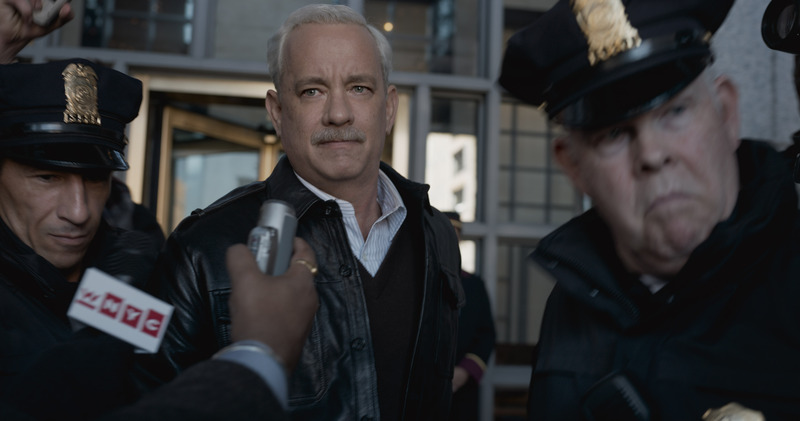 Tom Hanks is — no surprise here, either — just right as Captain Chesley “Sully” Sullenberger, the Ordinary American, who became an extraordinary hero by doing the right thing. The supporting cast is sufficient; the screenplay shifts smoothly from the death-defying incident to the drawn-out drama in the courtroom to the personal history of a principled pilot; and the editors keep things moving at a surprising pace, wrapping up the film in a speedy 96 minutes. I wish I could say that I loved it, but this movie makes painfully clear, for me anyway, just how much our personal experiences influence the way we receive a work of art. Since long before 2001 — since childhood, really — I’ve suffered nightmares about the sight of a passenger plane crashing into a metropolitan area and causing mass devastation. When I heard the news on the radio that morning in 2001, I thought I was having a particularly vivid dream, because I had seen it all before. The sight of downtowns full of explosions always makes me want to throw up — whether it’s live on the news or elaborately staged for the latest episode of The Avengers or Star Trek. So when Eastwood decides to acquaint us with our main character by dramatizing his nightmares of airplanes crashing into big city towers, my suspension of disbelief is knocked sideways — not only because those images have become so distressingly familiar and exploitative, but because I’m subjected once again to a personal horror. We throw around images of mass devastation so casually, how can it not injure our imaginations? I saw Sully on September 11, 2016 — 15 years after a morning that I (and most Americans over the age of five) have told stories about again and again. And I cannot separate those obscene Al Qaeda attacks on New York from the obscene ways in which Americans reported, exploited, distorted, and manipulated those events, using them to justify far greater violence and to enable American prejudice and greed overseas. While 9/11 brought New Yorkers together in heroic community efforts to save and to serve and to help and to heal, it also accelerated an already divisive and abusive political dialogue in our culture, enflaming hatred and a tribal self-centeredness in some parts of America. While we boast about how the attacks on New York proved that the American spirit cannot be overcome, we now live in a political climate that proves just how severely we have surrendered to fear, just how completely the terrorists own our cultural imagination. Whenever I see a picture of the burning towers, or a freeze-frame of one of the doomed airplanes, or a hashtag that says #NeverForget, I feel sick at heart for how brilliantly Bin Laden’s plot succeeded. Our response as a nation on the international scene has confirmed that the fears motivating our enemies are, to some degree, legitimate. And the America I was taught to believe in has proven to be, to a disheartening extent, an illusion. Those #NeverForget images and slogans tell me that Americans insist on letting anger, resentment, and fear do their insidious work in our hearts. They tell me we will go on retaliating, and thus throwing gasoline onto the very fires that threaten to destroy us — are already destroying us. They expose just how fragile and feeble our “faith” really is. Why do we need to see images of planes blowing up in densely populated downtowns in this film? Isn’t the sight of the New York skyline already haunted by such images? Aren’t they already permanently installed in our minds and memories? Wouldn’t it be more effective, Mr. Eastwood, to acquaint us with this character by focusing on Tom Hanks’s burdened expression? To see an example of what I’m suggesting, revisit David Lynch’s film The Straight Story: Notice how the film’s most disturbing moment comes when a Vietnam veteran (played so beautifully by Richard Farnsworth) suffers a flashback, and all we see is a haunted man staring into a void that only he can see. Less is more. And in this case, less would have made it much more possible for me to enter into this story of a human being’s horror and heroism. Frankly, I wish they’d cast somebody else. At this point in his career, Hanks is such an obvious choice to play Our Ordinary American Hero. And the proximity of this performance to his last Captain-In-Crisis film — Captain Phillips — is a serious distraction. Is he good? Of course he’s good. That’s the problem. He’s good in the Hanks-iest of ways. People will come to the movie to see Tom Hanks, and they’ll #NeverForget that they’re watching a great Tom Hanks performance. Similarly, isn’t Laura Linney tired of playing “the wife”? Of course, she’s just fine. But why must this role feature such a familiar face? How about bringing in an accomplished actress who isn’t quite so familiar to moviegoers, like Felicity Huffman, who would have been just as strong here, and who looks a lot more like the real person? But the possible casting alternatives isn’t a game worth playing: I wanted to see a character I believed to be Sully, not casting that is, in itself, an attention-grabbing gesture of tribute to the hero. I’m glad that Eastwood allows a redemption of sorts for the one character who has “VILLAIN” tattooed on his forehead. But really, did the film need such a glowering bad guy on the jury of the FAA hearings? 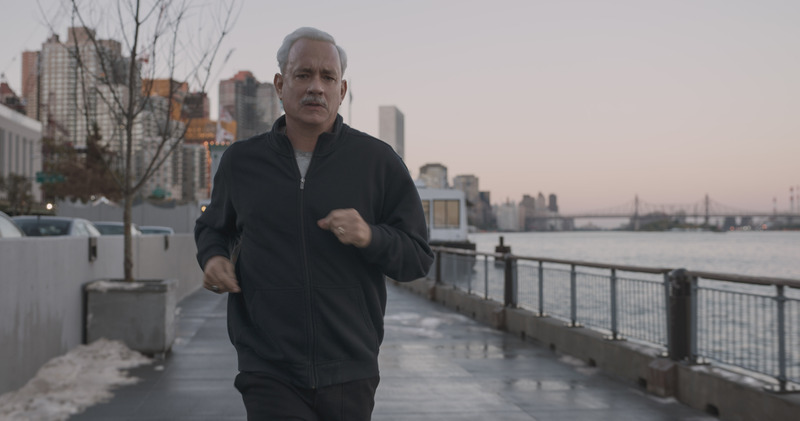 Moviegoers in the theater around me started snarling at him as soon as he appeared, before he could even give voice to his arguments, merely because he was so clearly positioned to oppose Tom Hanks Our Hero. I admire the film for how it celebrates the value of what artists have come to call “the 10,000 hours” of experience necessary to achieve greatness. 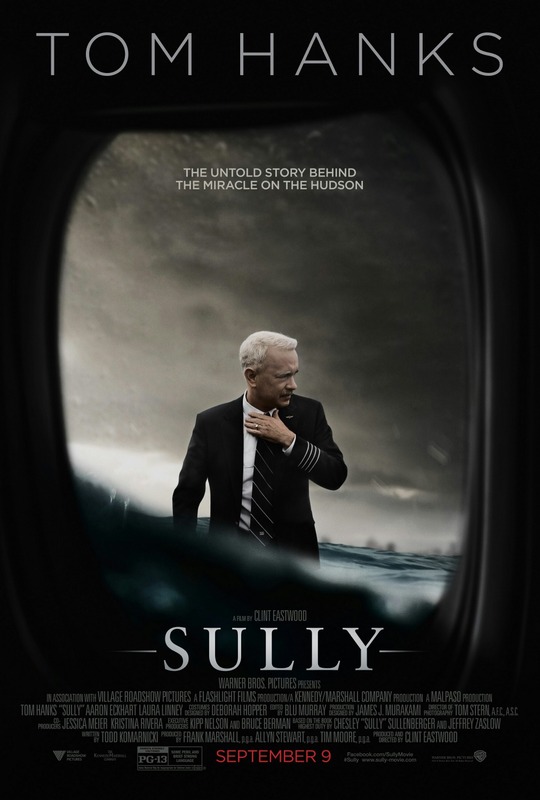 Captain Sullenberger’s 40 years of experience as a pilot — the film gives us glimpses of his experience in training flights and in navigating a dangerous situation during his military service — prepared him to keep his cool and make wise decisions when 155 lives (more if you consider the New Yorkers on the ground) were at stake. 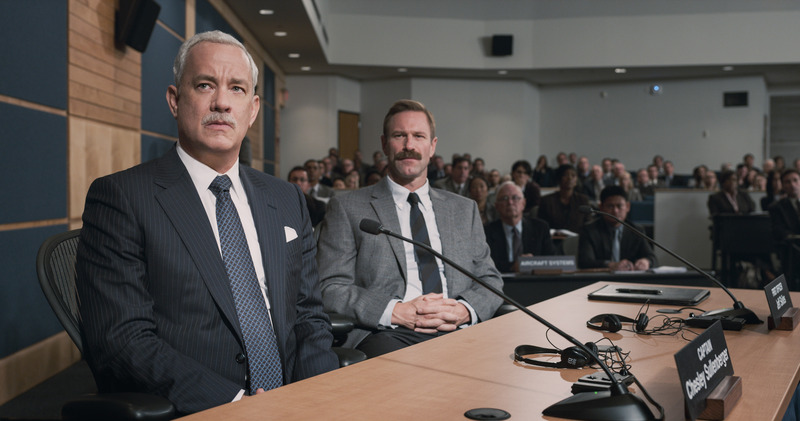 I cannot emphasize enough how important it is that we have films like Sully to highlight the irreplaceable value of “the human element.” This is a quietly powerful story about the importance of mastering, rather than surrendering to, machines. And I am relieved that the film brings back the very thing that President Obama emphasized when he identified America’s greatness as something achieved communally, not by isolated individual efforts. “You didn’t build that,” indeed — Sully rightfully emphasizes, whenever he is praised, that tragedy was averted by the good work of a whole community. And in doing so, he gives credit where credit is due and reveals that he is courageous, wise, and humble. I’ve been through an emergency landing. I remember pretty much everything about that day. It was United Flight 6107 from Denver to Albuquerque, on July 26, 2008. While I was earning my master’s degree two years ago, I wrote a 20-page essay that dramatizes that traumatic experience, one that interrupts the narrative of the near-disaster with flashbacks to my childhood obsession with airplanes (an obsession that ended when a commercial flight crashed within a few minutes of my childhood home). I wanted to tell the story in detail, once and for all, so I never have to tell it again. Needless to say, this movie’s depictions (plural) of the landing are realistic enough that I found them very difficult to endure. That’s not the movie’s problem. It’s just mine. And I never hesitate to let people know that United never offered me or my wife any kind of apology or compensation for our ordeal. After all that we endured — with a crying flight attendant, the “BRACE! !” training, the long span of time we spent circling Denver as I wrote a farewell letter to my family — United just put us on another flight, and nothing more was ever said about it. Anyway — that has nothing to do with my opinion of this film except to say that I hope those US Air passengers were provided with all of the counseling and health care they probably needed afterward. Recently I watched the original, 1954 version of Godzilla. Godzilla was a response to the Lucky Dragon 5 incident: A fishing boat called The Lucky Dragon 5 was caught in the fallout of a nuclear bomb test, causing many of the crew to die of radiation sickness and re-awakening concern about nuclear weapons. A city in flames, a mother comforting her children as death is near, burn victims, crowded hospitals — all images reminiscent of wartime Japan. Godzilla was the start of a, in the words of one critic, “therapeutic film franchise.” The purpose of Godzilla was to allow people to say “___ is what I’m concerned about,” not to shock people into feeling something while they ate popcorn and drank soda. I believe that there is a way to portray devastation and tragedy that doesn’t come across as exploitative. But it takes skills that the makers of the must-appeal-to-everyone-around-the-world blockbusters don’t have.